We were asked to renovate a large hall in a high end property built in the late 80's. In many new homes the finish is often applied for appearances only. The problem here was door architraves. Well not the architraves themselves, but the lack of thought before they were fitted. However the plaster had been taken onto the frame and not removed by the painter prior to applying the wood coatings. The problem? Plaster does not adhere to wood! The paint was in poor condition and all the frames up to the architrave has to be stripped back to bare wood prior to sanding with Abranet abrasive. We used an Olfa BTC 1 blade and a Linbide scraper. Although this is a simple process it is time consuming and adds cost to the job. 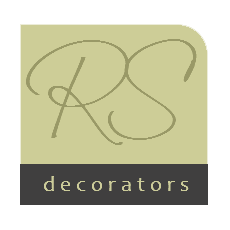 We always remove defective coatings prior to redecorating with the correct primers based on the clients choice of top coat. In this case we used Zinnser Coverstain, which is a high build oil based primer for problem areas. It can be over painted with any decorative paint once dry. 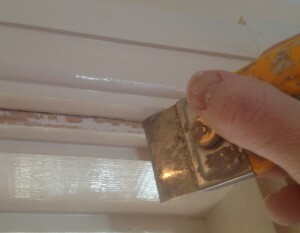 By using this technique and the correct paints it means the frames and architraves will last for many years. We also recommend using water based paints for top coats on interior woodwork as they retain their original colour. I could digress and discuss the fact that new homes today are being painted with oil based wood paint. It looks nice for a few months but will soon become yellow!